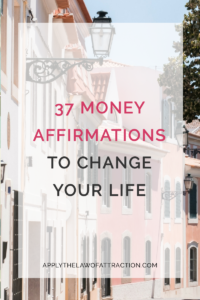 How can Money Affirmations Turn You Into a Money Manifesting Genius? Money brings up a lot of different stories. They aren’t always happy stories. They can be filled with fear, hopelessness, anger, insecurity, and more. Whatever your money stories are, they often are based in things you heard, saw, or experienced when you were quite young – before the age of 7. You don’t have to remember the experiences, but they’re sitting there waiting in your subconscious until you need them to help create your money store today. You aren’t good with money. If you have money, you’ll be taking money away from others. People with money are bad. There is a limit to how much money you can have. Money goes out as fast as it comes in. When you know what your money beliefs are, you can start changing them to create a new money story. Money affirmations can help you shift your money mindset to one of wealth, prosperity and abundance. I am so happy and grateful that money flows to me easily and effortlessly. My relationship with money gets better and better every day. I release all resistance to receiving money. Isn’t it wonderful that I constantly attract opportunities to receive more money? I have more money than I could ever spend. Money falls into my lap in miraculous ways. I have millions of dollars in multiple bank accounts. My money allows me to have a life I love. People love giving me money. I have fun earning money. It is safe to be wealthy. I love how easily I manifest money. I am happy, healthy and wealthy. I can easily afford anything I want. I am a good money manager. I trust that more money is coming to me. Every dollar I spend comes back to me multiplied. I love having multiple streams of income. I deserve to be financially rewarded. I am grateful for the money I already have and the money that’s on its way to me now. It’s easy to make money. It’s safe for me to have more than enough money. It’s safe for me to release what isn’t working. It’s easy for me to change my money story. I release my resistance to money. I reclaim my money power. I am what a wealthy person looks like. There is room for me at the top. I make empowered financial decisions. Would you like some help finding your money blocks? I have a free 30 second quiz that will show you what is holding you back from an abundant life. Just answer a few simple questions, and it'll show you the no. 1 subconscious ‘Success Blocker' that has quietly sabotaged your wealth and success since childhood.